I now firmly believe that spring is on its way. Boston has been gracing us with some gorgeous weather these past few days (after snowing twice over the weekend), and I can’t help but smile as I walk down the streets, breathing in the urban smoke and bus fumes fresh air. It’s not quite warm yet, but as long as I don’t have to wear my marshmallow jacket, I’m good to go. I really don’t have time for blogging this week, but I’m blogging anyway. 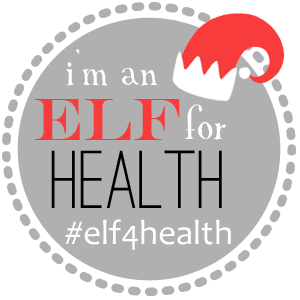 As I said on Monday, blogging is therapeutic, especially since my posts are typically lighthearted. 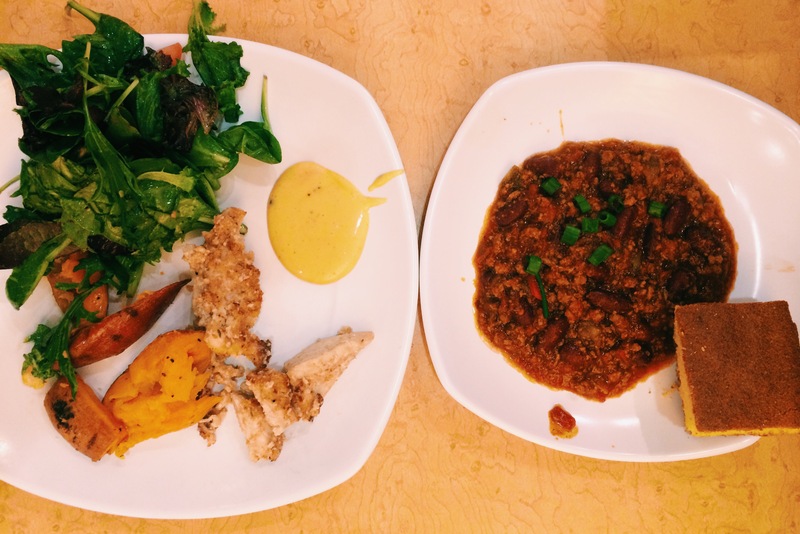 So today I’m sharing you some of my recent eats, along with some fun facts about each! Thinking out loud style— with Amanda! 1) Pepper shakers don’t dispense the pepper fast enough for me. 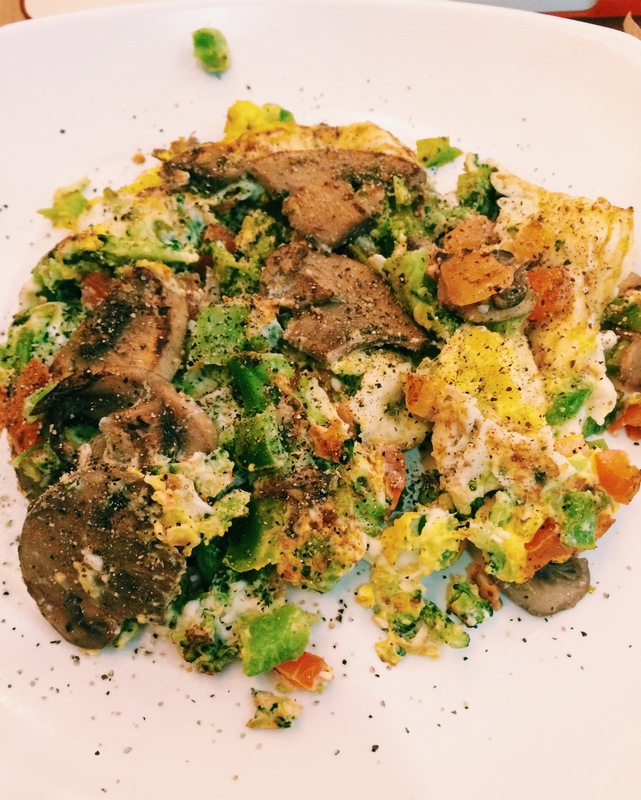 I only add pepper to my eggs nowadays, but when I do, it’s like a Boston blizzard of pepper. I douse my omelets with it. Sometimes I take the top of the pepper shaker off if it’s not coming out fast enough. 2) The dining hall does not know what curry is. 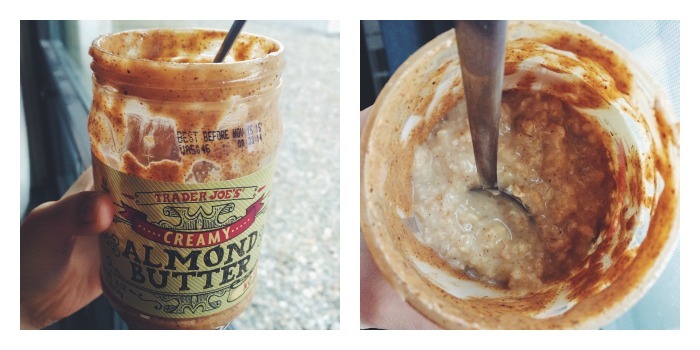 3) I didn’t finish off my almond butter jar just so I could have oatmeal in a jar. These weren’t overnight oats, but it still hit the spot. I microwaved some quick oats with cinnamon, a pinch of salt, and water. Then I stirred in vanilla protein powder and a sliced banana before letting it cool and dumping it into the almost empty almond butter jar. Perfect. 4) Some days, I unintentionally go pescetarian. 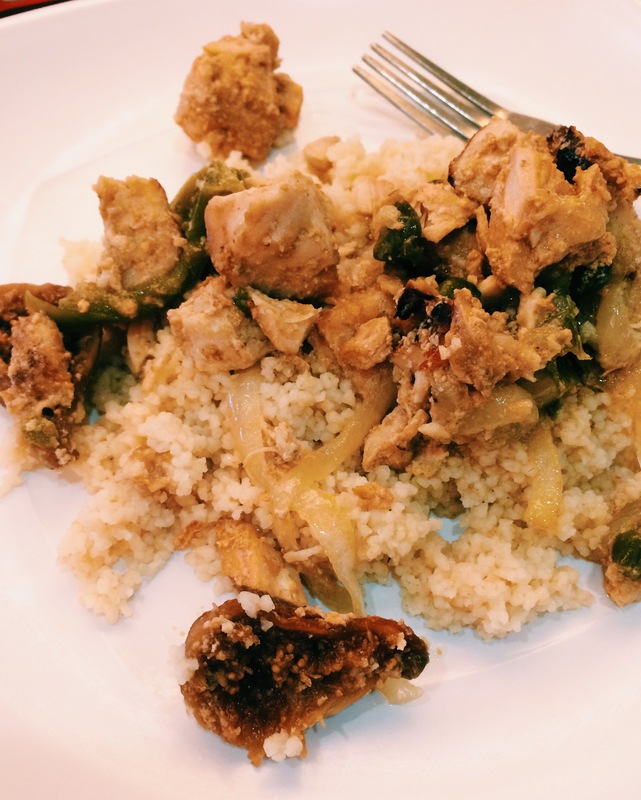 5) This Moroccan chicken and couscous dish had dried figs in it and I FREAKED OUT. I freaked out because I ♥ dried figs and this made me very happy. 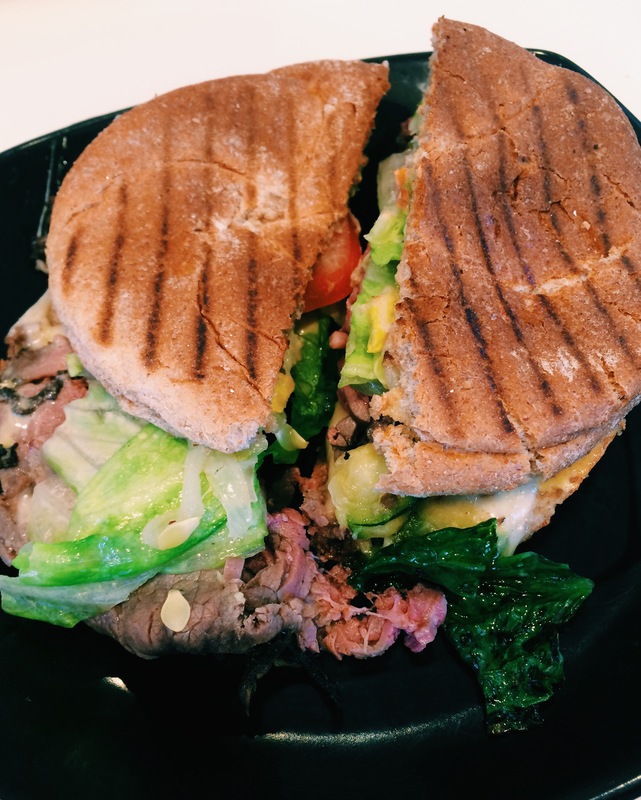 6) This was the sandwich of my dreams. This was a whole wheat roll with roast beef, pepper jack cheese, lettuce, tomato, roasted vegetables, and honey mustard, all toasted until the cheese was melted. Yes, it was messy. Yes, it was bomb. 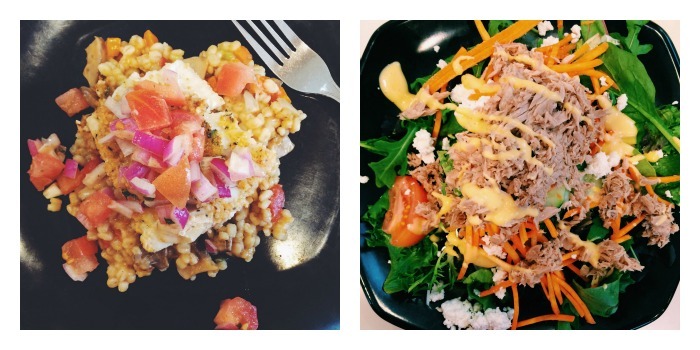 7) When the dining hall has Sargent Choice (all healthy options) night, I ironically become very stuffed because I want to try everything…because it’s all healthy, right? 8) Hi, my name is Alison, and I am a bananaholic. I won’t deny that it’s a problem, but listen, I could be hoarding much worse things in my dorm. I freeze some for snacks. 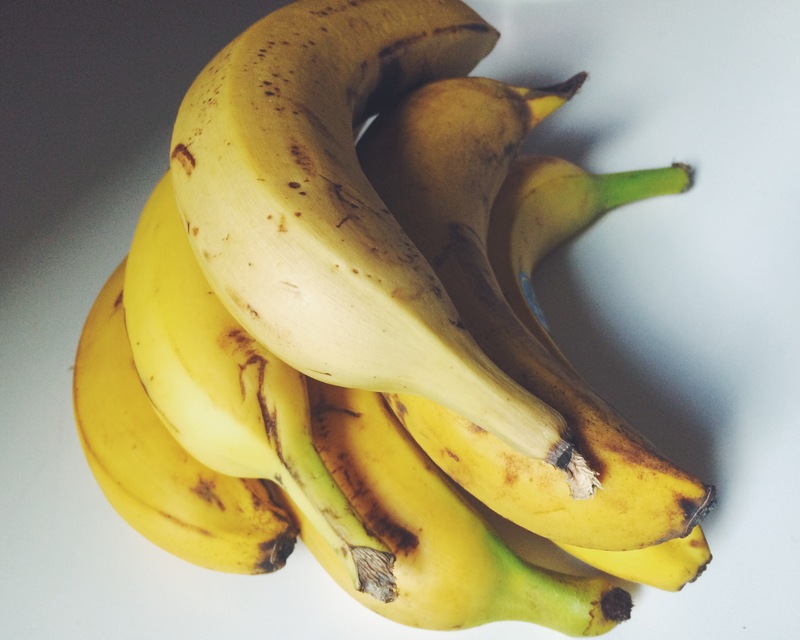 The bananas are usually greenish when I take them from the dining hall, so I let them ripen in the dorm for a little bit so that I can take them down to the dining hall to eat with my breakfast on a later day. I like my bananas slightly spotted when I’m eating them with toast, oatmeal, pancakes, etc. because they’re sweeter (and healthier!). 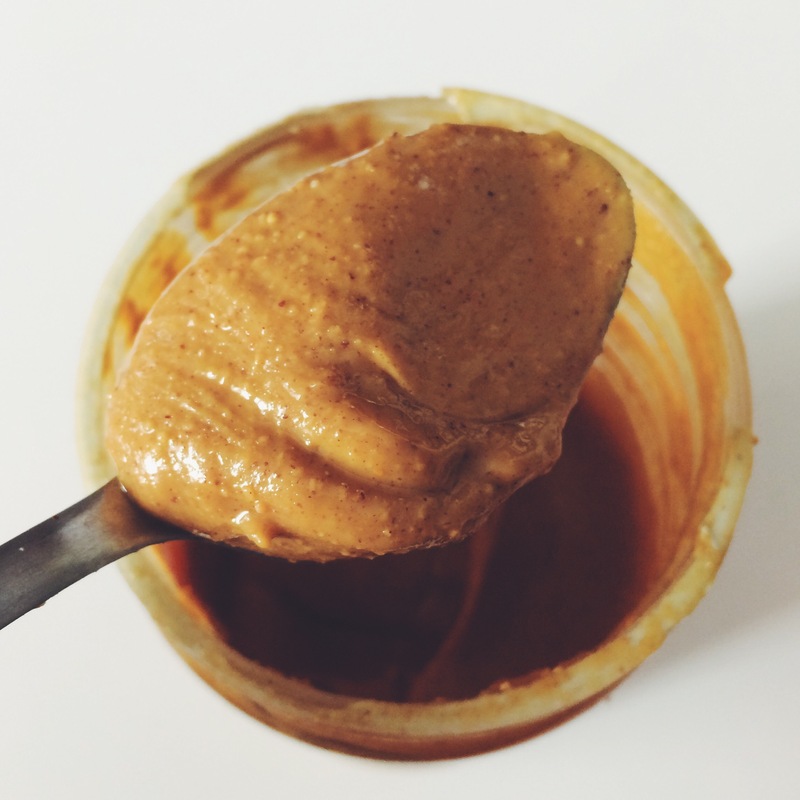 9) I’m on the brink of an emergency because I’m almost finished with my second jumbo Costco-sized jar of peanut butter of the semester. Alison’s body composition: 65% water, 25% peanuts, 10% bananas. 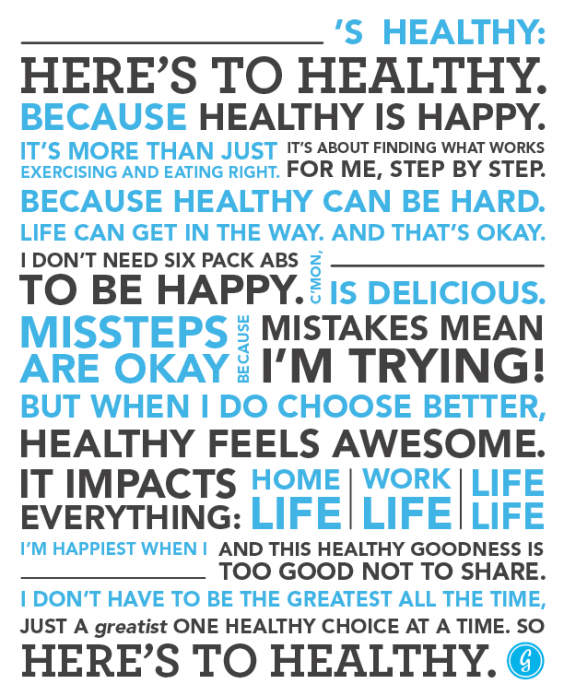 10) I hope you all have a wonderful day filled with nutritious and delicious eats! Let us give thanks (especially on this Holy Thursday!) for the food we have to nourish our bodies and souls. Go be the sugar, spice, and everything nice in someone’s life today. Do you have a holy grail condiment or spice? Have you ever eaten an imposter ethnic food? Is it easy for you to go meatless? This entry was posted in Food, Life and tagged almond butter, balance, bananas, boson university, breakfast, chicken, dining hall, dinner, dried figs, eats, eggs, fish, food, good friday, healthy, holy thursday, lent, lunch, meatless, Oatmeal, oats in a jar, omelets, Peanut butter, pepper, pescetarian, roast beef, Salad, sandwich, sargent choice, snacks, tuna. Bookmark the permalink. Cinnamon is also something I put on/in a ton of things, but I’ve never put it on eggs! Very interesting! I’m gonna have to go with cinnamon as my holy grail condiment… I put that stuff on -everything- and it’s kind of scary how fast I can go through mass quantity of it. And you know the banana bit made me super happy I go through so many of those suckers, and it’s gotten to the point where I have to hoard bunches of them in my kitchen as well if I want to have ripe ones! Coconut oil or grassfed butter for me! It usually makes it on to one meal or another throughout my day. Lee (from Fit Foodie Finds) is doing ALL overnight oats recipes this week (!!!) and I’m so excited to try the recipes — as soon as I get some oats back in our pantry! Coconut oil is amazing. I miss it! I also miss real overnight oats. I’ve been drooling over all of Lee’s recipes!! ME TOO! I need to remember to make them tonight. I always forget until right when I get into bed, and by then, it is already too late! Have a wonderful day Alison!! Waaahhhh. Blogging is therapeutic for me too, wish I had more time to sit at a computer and dump my thoughts here more consistently. Looks like I am getting into the whole YouTube thing, so maybe that’s sharing some of the time? Either way, gimme yo’ egg scramble. The dining hall looks like a Panda Express wannabee, but better! Wait, I take that back…gimme that sammich!!!! Hi bananaholic, I miss talking to you and will ocassionally stop in just to say, HIIIIIIII! ❤ Love you forever girl! I love cinnamon for sweet stuff and black pepper for savory stuff. They’re both lovely ❤ And I can go meatless pretty easily as long as there's Greek yogurt or cottage cheese around for an extra hit of protein. And if fish counts as "not meat" (that always kind of confuses me), then I definitely can because I love fish/seafood! Some people still count fish as meat, but with respect to Lent, it doesn’t count 🙂 Greek yogurt and cottage cheese are also my favorites!! I put cinnamon on and in so many things! And turmeric! And Braggs all purpose dry seasoning blend. Chili flakes. Okay I’m done now. You know how to spice up life. I need to try more turmeric! You take THE BEST food pictures Alison. I love them. Any tips? Ah I’m flattered that you think my dining hall iPhone pictures look nice! I’m no pro, but my tips would be natural lighting, a good angle (usually from directly above, but sometimes from the side looks better), simplicity (as little in the background as possible), and VSCO Cam app are what help my pictures look the way they do! 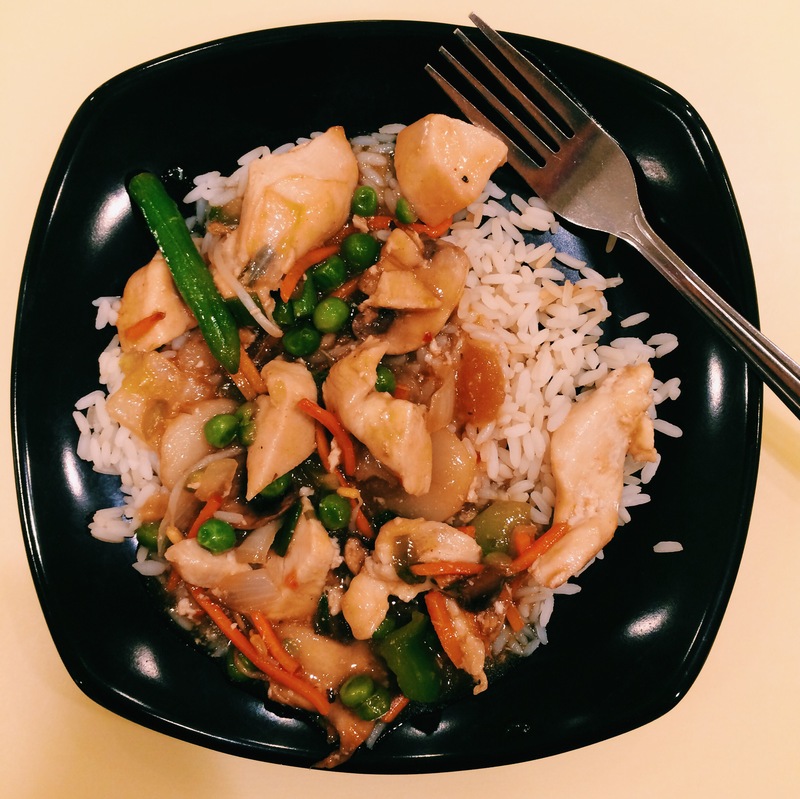 I am offended on behalf of that ‘Asian’ dinner…. haha. And dried figs- You’d love the Persian ones my mum smuggled from Iran lol, so sweet and well. Sweet. The pepper saga is real. I always take the tops off, and sometimes, I’ve been punished with it all pouring out. I love bananas too, but I never used to. Before I started running I hated them. I wanted nothing to do with the mushy, stinky things. Then I started running, and before long, I started craving them. Now I always have them in the house. How sad about the “curry chicken”. It’s amazing how you started craving bananas after starting to run! Our bodies are so smart. I add a ton of garlic and pepper to my eggs. I was raised with a momma who loved to season and I definitely have held onto that! Oooo garlic sounds awesome with eggs! I put black pepper on eeeverything, it’s my favourite spice! It’s like salt. That’s why it’s salt&pepper. They go hand in hand. I guess they’re married or something. I also like mustard a lot, especially French whole-grain mustard. I love it spread on toasted bread, with meat, I even mixed it with my eggs to make an omelette. Something about that spice plus slight tartness…mmmh! I’ve been to Düsseldorf the other day and it’s famous for its “löwensenf” (Lion mustard). In speciality store they had hundreds of varieties (not really that many;-) ) and I got a chili and a coconut-curry version. So YUM! I love honey dijon and whole grain mustard! But WHOA chili and coconut curry mustard sounds fantastic.